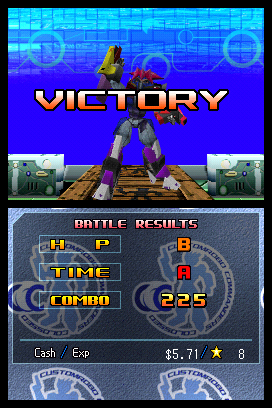 Custom Robo Arena is very much like Custom Robo for GameCube. It's a familiar concept that battles are waged between robots and not between people. The twist is that you play as a kid who does all of the battling, not as some kind of futuristic soldier. And the battles take place in a ring, or arena, not on the battlefield. The robots are small and called "robos" instead of being some sort of huge mech kind of thing. Overall, the game has a charming interface and graphics, and the combat is limited to taking place in a ring. I think the combination of those factors makes this a very good game for children who are interested in robots. Also, geekier adults, such as I, will enjoy the extensive robo customization features. I had actually written a much longer review, but for some reason it simply disappeared. My guess is that I hit "publish" but didn't hit "save". Gotta love duplicating my efforts. You play as a kid who is starting a new school and wants to join the robo team. In this, you walk around the town and talk to people. Unfortunately, this part reminded me of Pokemon for GBA, which is my way of saying that it isn't really up to DS standards. Although, to be fair, when you talk to someone the artwork is pretty good. It's just that the exploring the town part is very basic. The real action comes in the robo arena. Before the battles you can tweak your robot by modifiying different parts such as guns, pods, body frame, bombs, and legs. You can make your robot heavily armored and slow, or give it one really good gun, a light body, and then hop around and shoot. The ability to customize your robot so heavily is a major strongpoint of the game. There's strategy involved in building and configuring your robo and then there's tactics involved in the actual fighting. Fighting is pretty fast and frenetic, and best of all no one gets hurt so this seems like a pretty good game for kids. I also like the way that the fighting is confined to a ring, which sends the message that fighting is only ok under controlled circumstances. Multiplayer pits two players against one another in a holosseum chosen by the players. They can play over local wireless or Nintendo Wi-Fi Connection and, if only one player has a game card, using DS Download Play. 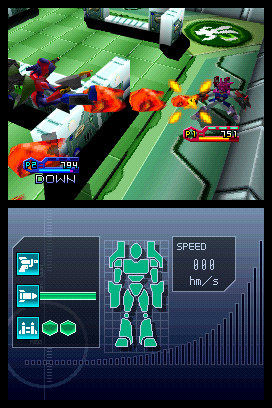 Players can speak to one another during a match using the DS microphone. Players also can trade dioramas with one another and show off poses they've created for their robos. The combination of customizing your robot and then fighting other players online means that this game has virtually unlimited replayability. The only thing I didn't really like was the whole polishing your robo thing. As your robo fights it gets dirty, especially when you lose. If it gets too dirty it won't work right, so you have to take a polishing cloth and clean it. You use the stylus to polish your robo, like brushing your dog (my beloved Teddy) in Nintendogs. To me, this felt tacked on just to give the game an excuse to use the stylus. 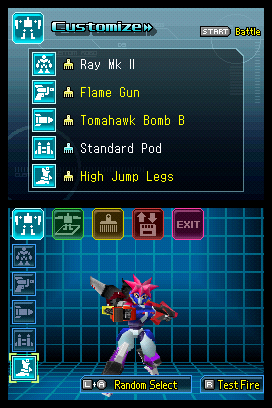 I really like Custom Robo Arena. The music, which is usually aggressive electric guitar, is very good at building the mood. I have had some fun with it. The funny thing is that I keep thinking about the Simpsons episode with Chief KnockaHomer.